Author’s note: This post was originally published on March 16, 2012. For some reason, it had attracted daily spam comments for one year straight so I moved it to drafts. I’m experimenting now by republishing the post to see if the crazy spanners from all across the world find it again. 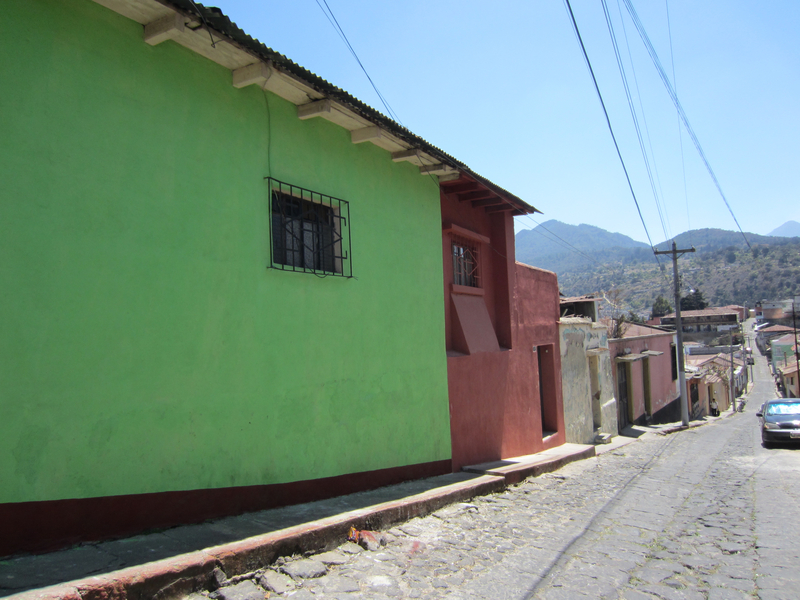 I enjoyed this post and want to keep it on my blog as it documents my week doing a home stay and Spanish immersion in Guatemala. Here it goes again! I arrived in Quetzaltenango, or simply called Xela (pronounced “Shay-la”), as the sun was setting across the lush, volcanic valley. I was exhausted from the day’s travels and the total immersion into a new country with a new language as a solo traveler. It had been a long time since I’d traveled completely alone. Yes, I had spent a few days alone here and there before my previous volunteer trips in Morocco (April 2011) and Costa Rica (April 2010) the past two springs. Yet, I was always welcomed a few days later by an entire volunteer crew of English speaking friends. This time was different. 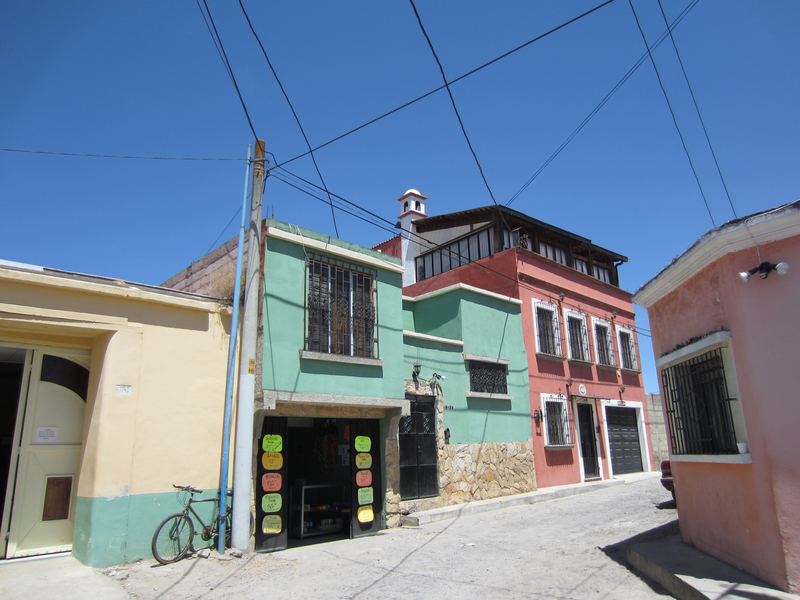 I would be spending the week in Xela, Guatemala’s second largest city, in a home stay with a local family. There would be no english spoken whatsoever and I had never met them before. All I knew were their names and their address. That was it. Thankfully I had the entire week arranged by my son’s Elementary School teacher, Ms. May, back in Minneapolis. Ms. May is married to a Guatemalan and although they live in Minneapolis, they have ran the language school program at Casa Xelaju for 25 years. I had a good, trusted contact. That was all that I needed to give me the push to go. I was really looking forward to spending time in Xela as it is known as the true Guatemalan experience. Located in Guatemala’s magical Highlands, Xela is surrounded by verdant volcanoes, lush vegetation and spectacular farmland. The city itself is home to many universities, cafes and beautiful architecture dating back to the days of the Spanish conquistadors. Xela is also known for her lovely, vibrant indigenous culture as the area is highly inhabited by the Mayans and you can see their gorgeous colorful clothing in almost every cobblestone street of the city. It is not well touristed and the perfect place for the serious traveler who has their mind set on immersing themselves in Guatemalan culture and spanish, while enjoying the multitude of volunteer opportunities and adventurous endeavors. I arrived at the bus stop and out of habit searched the crowd. Why I did this was strange to me as I didn’t know who I was looking for. I only had a name on a piece of crinkled paper. Luis Enrique, the brother-in-law of Ms. May who was going to pick me up and deliver me promptly to my family for the week. I waited and waited. There were no bites. After ten minutes the crowd cleared away and I was left standing on the curb in the dark with my big red suitcase. I went into the bus depot where the friendly, helpful staff knew exactly who I was waiting for. Apparently even in a town of 200,000 everyone knows everyone. They gave him a call and told me he was on his way. I smiled and said “gracias” kindly and played with a little girl who was holding on clumsily to her young mother. Within five minutes, my ride was there and I was greeted warmly by Luis Enrique and thrust into conversation using my tired, broken Spanish. 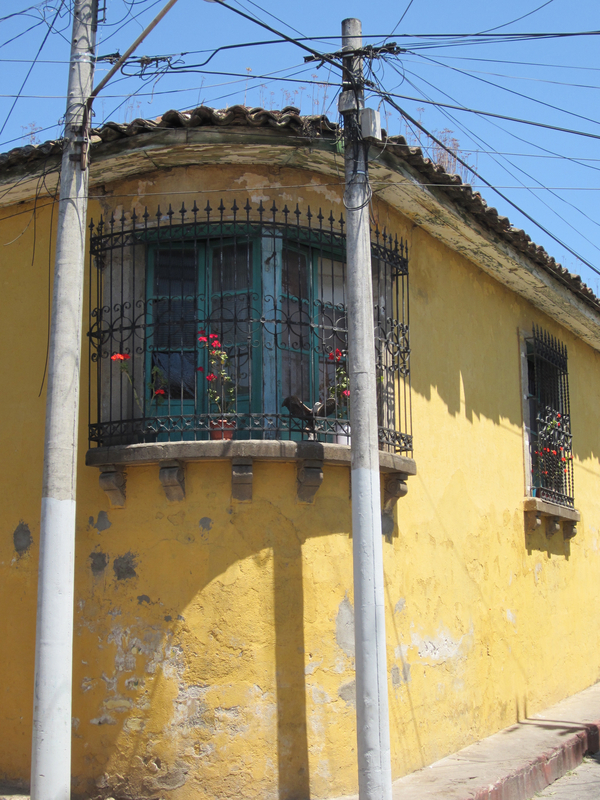 We arrived at the home in Zona 1, the central district of Xela and the heart of the city, only a few minutes later. There, he rung the door to a green-colored house and a moment later it opened. I took this picture the next morning since I arrived in the dark. My home away from home is the pastel green one pictured above. The family ran a cafe outside of their garage where they served Sondra’s fabulous guatemalan cuisine. The layout of the home was misleading. The front opened up to a small apartment, a living room and kitchen in back. Next to the kitchen was a bathroom and my room. Next was a courtyard, which is traditional in most Central American homes, followed by a larger house with many rooms that housed 8 people. I loved it because everyone said “Buenos Dias” to you each and every morning and looked you in the eye. It was such a close-knit community! 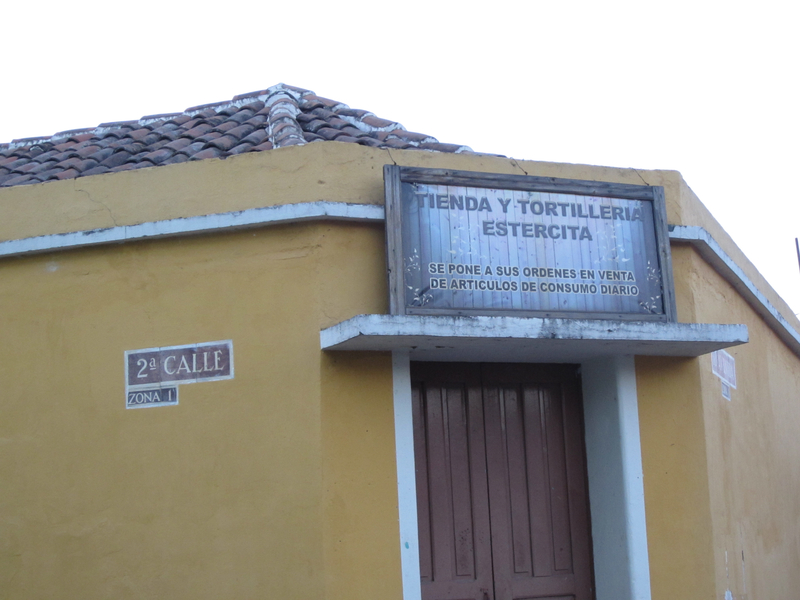 And of course, there was a freshly made tortilla stand only a few buildings down from the house! in Guatemala, you eat tortilla with everything and I fell in love with their fresh, warm, delightful taste. I can taste and smell it now…..Mmmmmmmmm! 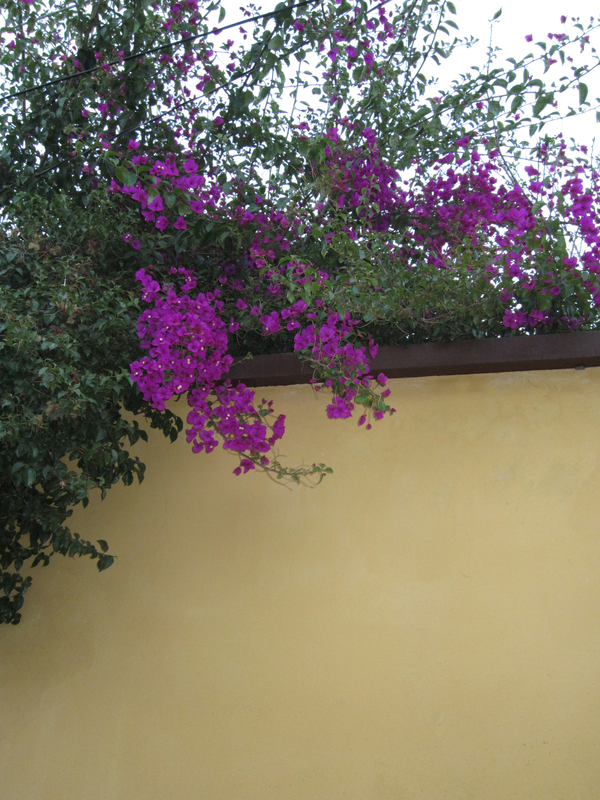 I adored the architecture, the colors and the flowers! After a winter here in Minnesota, all the colors lit my eyes on fire! They call Guatemala the “Land of Eternal Spring”! Ahhhh….it was so lovely. 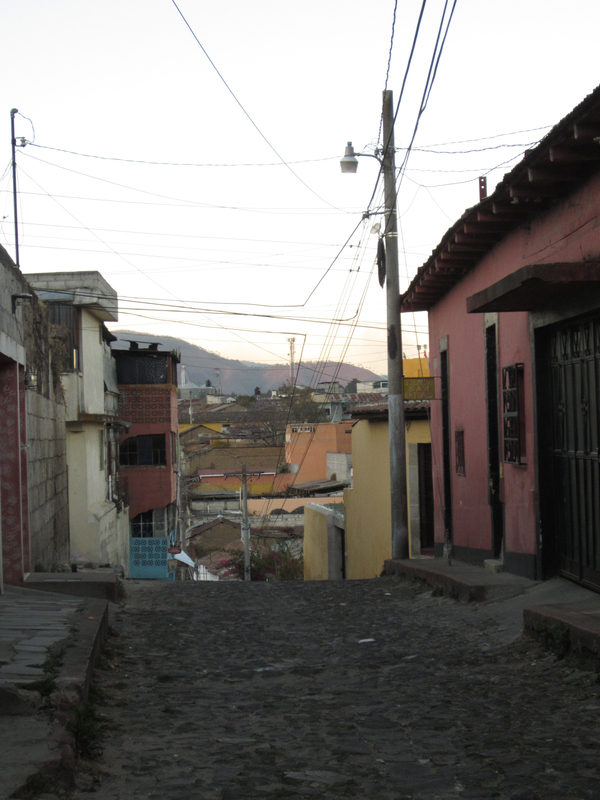 Xela is also very hilly, just like San Francisco. I loved the views from the hilly streets! I sure felt like I got my workout! (No, I didn’t do my daily runs. I’m not that crazy. But between the hills, the mountains and the cobblestones, I did burn quite a bit of calories and got to indulge each night in Sondra’s delightful Guatemalan cuisine. This is my favorite picture of the post. 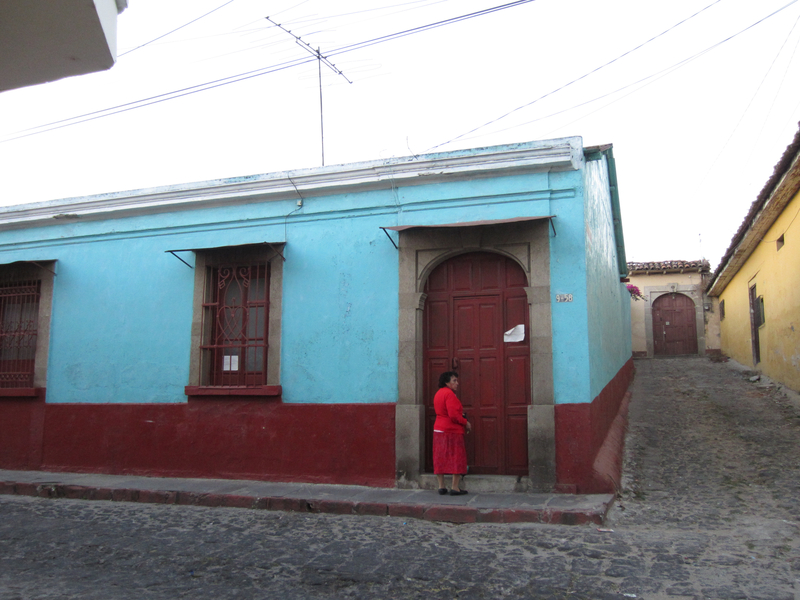 I love the brilliant contrasting colors of the house and the fact that the woman was wearing red made it even better. I tried to wait for her to turn and open the door as I think the picture would have been so much better but I think she sensed my presence. Stay tuned….I’m leaving you with a cliff hanger and not completing the story on purpose! What was my host family like? You’ll have to wait and see to find out! I love telling stories! Hasta luego! Great photos. In my town here in Sardinia, each day Im greeting with buongiorno’s. The first few months I was confused, wondering why so many strangers were saying good morning to me. Now I play along, it’s a nice warm feeling. That is so nice! I love that feeling. People are generally pretty friendly here in the midwest too. I like that part about life. 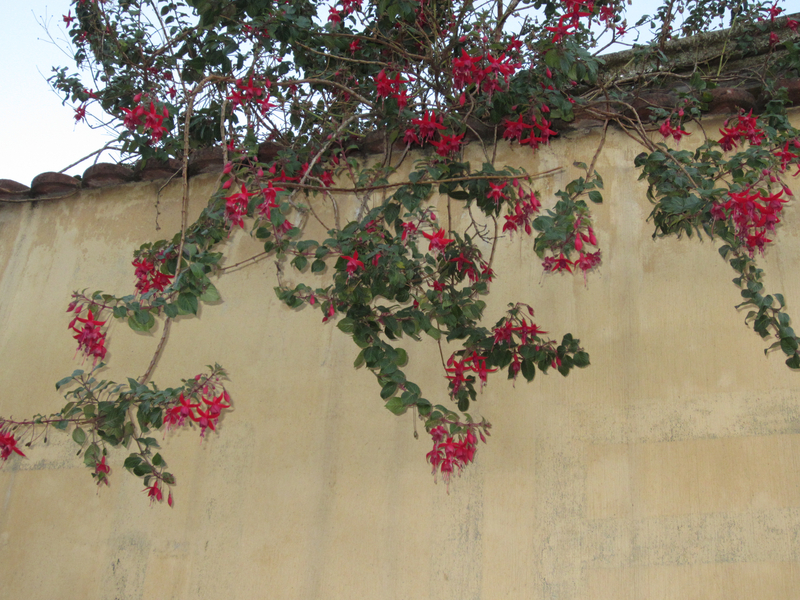 Xela looks so beautiful – I just love the mix of cheery colours, flowers and telephone cables. Just wondering, did you get many stares from the locals or were they very relaxed about your presence? It wasn’t too bad, nothing like India or China. Can you believe it? Most people there are used to having a small group of foreigners there studying. They would look at me with curiosity but were always kind. However, I also had to be extremely careful as Guatemala is not the safest place. Once it was dark, I couldn’t be out alone and was careful not to walk alone on deserted streets during the day time. There are a lot of muggings, armed robberies and kidnappings sometimes….similar to Mexico. Thus unfortunately you have to be careful. I had no idea personal safety was such an issue in Guatemala – somehow I thought that it might have been a little better than the surrounding countries! Thanks for letting us know. It was surprisingly not too bad. Maybe because I’m getting older now…ha ha! You make me jealous! My Spanish now is only good for eavesdropping on the Uruguyan consulate in my office building. Chinese has completely taken over my brain! Wish I had the opportunity for a spanish home stay to wake up my brain. I can’t imagine how hard it must be to speak in Chinese!!!! Wow, I’m impressed as I thought Spanish and French are hard! Do you ever watch House Hunters International….HGTV. They have gone to Guatemala at least three times. Great videos of the country. No I haven’t watched it but heard about it before as my parents love it. That would definitely make me want to move!!!!! I will have to check it out. Thanks for the tip! I have not seen this show but have heard about it. I know it would be big trouble if I watched it as I’d always be wanting to move!!! Love it, Nicole. Will you share photos of the inside of the house, as well? I would love to see how people live. What was your room like? Can’t wait for more! Nicole, glad you enjoyed Xela too! I am enjoying reading about your experiences in Guatemala. I am planning to go there in April and am interested in doing some Spanish immersion as well. Can’t wait to hear about the rest of your experience! Great! You will love it! Let me know if you have any questions about schools or destinations. 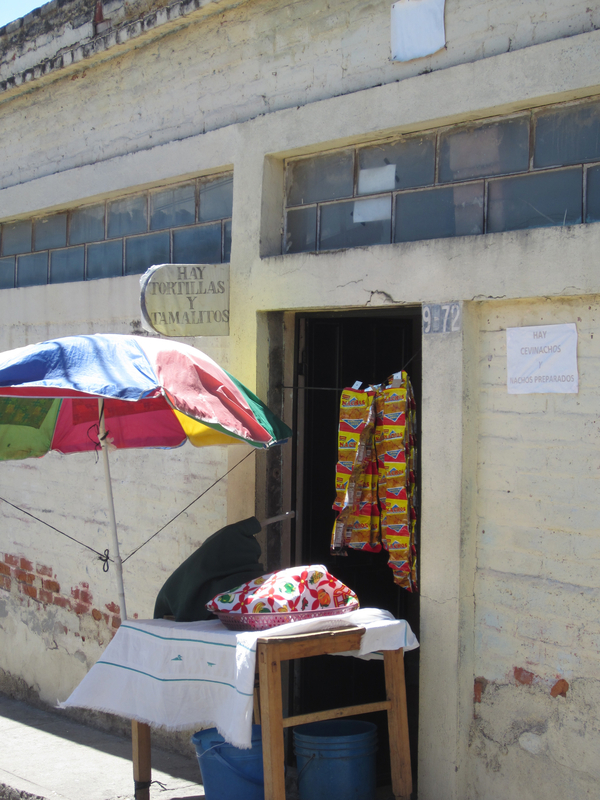 Antigua is a huge hot spot for Spanish schools as well as Xela. Make sure you see Lago Atilen (spelling?) as it is supposedly unbelievable. Feel free to email me with any questions as I’d be happy to help! Great! I replied but now can’t find my reply so am not sure if you got it or not. I loved Guatemala and if you have any questions bout your upcoming trip and planning, please feel free to contact me as I’d love to help! You’re an Editor’s Pick and on the cover of Open Salon again! You go, girl! Just noticed it! Thanks! It always is nice to see your blog post there! I’ve seen lots of yours there too! Hi would you mind stating which blog platform you’re using? I’m going to start my own blog in the near future but I’m having a difficult time deciding between BlogEngine/Wordpress/B2evolution and Drupal. The reason I ask is because your layout seems different then most blogs and I’m looking for something completely unique. P.S Sorry for being off-topic but I had to ask! I use the free WordPress and love it. I have a premium upgrade theme but there are many wonderful free themes to choose from. Good luck!